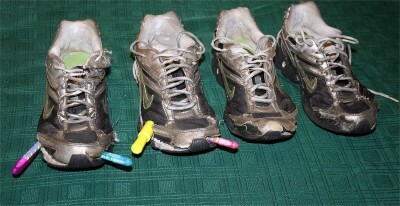 I’ve been conducting an experiment that I recently terminated when I bought a new pair of Nikes for jumping. I was trying to see how much abuse my old ones could take before I couldn’t jump in them anymore, but life’s too short, or might be. Because of the nature of JumpRock, the uppers (above the sole) go through some unusual stresses for a sneaker, primarily stemming from the front of the foot exerting pressure repeatedly on the front of the shoe. Partly from the impact of landing and partly from the pressure of pushing off; your toes tend to tense together into a big wedge that you grind forward into the shoe, with the pressure exerted at whatever angle you’re jumping or landing at. As you can see for yourself from this picture, my big toe broke all the way through on both right shoes, and stretched the inner canvas far enough to partly break the outside on the lefts. Also on both right shoes the pressure from the outside of my foot has torn through the material. But I come to praise Nikes, not to disparage them. These shoes are like the Fairchild Republic A-10 Thunderbolt II warplane that flew in Vietnam. Known as the Warthog, it’s famous for being to take an incredible amount of damage and keep on flying. Well these Nikes have taken an incredible amount of abuse and yet I jumped in them right up to yesterday. Think of the thousands of impacts over the maybe four years since I bought them. Something had to give. When the stress became too much, did the seams come apart? No, they did not. Did the soles come loose at any point from the side stress when I land on the outside of my foot? No, they did not. 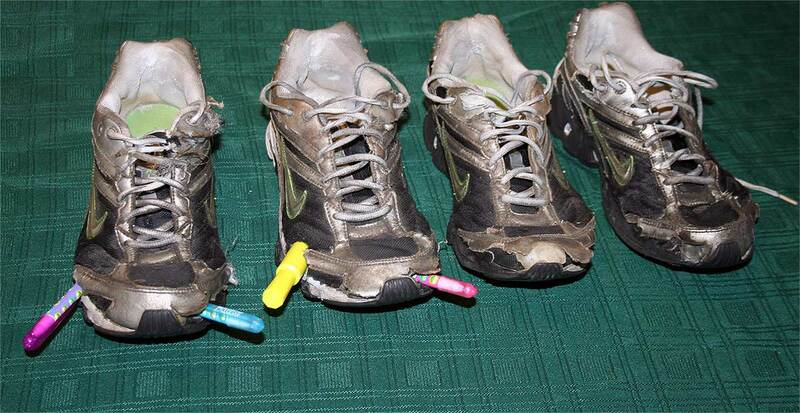 In both cases the pressure punched holes in the material of the shoe. The seams are actually stronger than the material they hold together, so when the pressure is unbearable they still hold together – the alternative is that the shoe would come apart and be unwearable – and maybe dangerous in the process of becoming that way. But I did love the old ones. You can see that I bought two identical pair. As I recall they were at a really good price at Mervyn’s, which will tell you it really was a long time ago, and I liked the style, so I bought two pair. 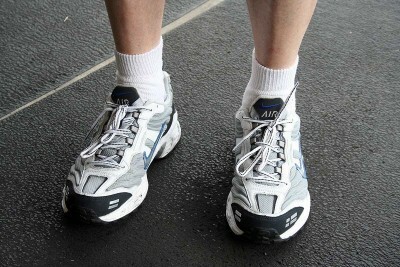 That’s the other great thing about Nikes – you don’t have to buy top of the line to get an excellent shoe. And that’s the thing about these shoes. They started out excellent and are still excellent even in their beat down state. They served me longer than anyone could reasonably ask, and could go on, but it’s time to let them go and I WANT NEW SHOES!!! So it goes without saying that I will always wear Nikes, because they seem to be indestructible. This new pair may outlast me, because I know I can’t make myself indestructible; but I can extend the amount of time when life is worth living between now and the end. I wasn’t even thinking about that kind of stuff when I started learning to jump rope. It’s only after JumpRock started to change my agility and stamina and actually increase my fitness, even though I’m in my 60’s, that it occured to me what I was onto. Think of it. I only ever exercised because it made me feel good afterwards. From exercise bike at 31 to jump rope at 55, which is when it started to become fun, because of how jump rope goes with music. Now I’m more fit and have more stamina at 64 than ever in my life, including after army basic training. So I’m the luckiest guy in the world pretty much, because if you’ve got your health you’ve got everything, and I’ve got more health, in the form of fitness, than I could have imagined having at this age. And as a huge bonus I can still enjoy the cause of it all, JumpRock, nearly every day of my life. So get some Nikes and put them to use. Whatever activity that you can do safely and at least tolerate, like me and exercise bike for 24 years — JUST DO IT!!! 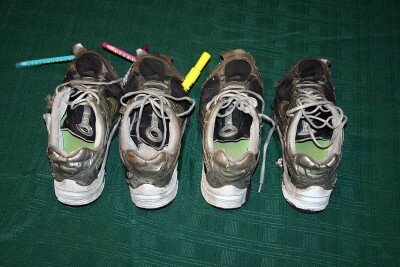 This entry was posted in Jump Rock and tagged durable shoes, indestructible, jump rock, Nikes. Bookmark the permalink. 6 Responses to Are Nikes Indestructible? Youre the man Richard. Truly an inspiration to all of us out there. Ive recently started enacting some of the same habits you speak of, and im already in better shape! JumpRock rules. That’s really nice to hear. My Karma appreciates it. Great site & inspiration, Richard. Can you suggest which Jump rope I buy & maybe a YouTube video or two to learn how to jump more efficiently? I can go for about 30 seconds max before I get tired. I jump too high, land too hard @ 242lbs., & mess up my rope revolutions still. Thanks. This is the rope I use. I tried a Valeo Speed rope several years ago and it seemed heavy to me for a speed rope. You can also get it on Amazon but I don’t see where you can select the handle color and they show the normal buyjumpropes price of $8.95 as their sale price when last I looked. Aside from saying I think the lighter rope will help, the only thing I can suggest is persistence. I absolutely could not jump when I first started unless you count an awkward little skip, like I was afraid to get both feet off the ground at the same time, which I was. So I had to force myself to hop over the rope with both feet together and if I could get two in a row I was doing good. And I only improved very gradually, so it took quite awhile before I could jump with any consistency at all. The efficiency will come as your body learns the timing. And I used to get tired very quickly. But it’s all worth it because once you can jump with consistency your stamina starts to build, and you get to where you can back off and get your breath while still jumping. It may seem impossible that you’ll get better sometimes, but I went through the whole thing all over again when I was trying to learn crossovers, which is when you cross your hands in front, and doubles. My brain did not have a clue on when to jump and how high so it’s literally trial and error as it learns. Crossovers really seemed impossible, but look what I can do now. The one thing hard to avoid in the beginning is the bunny hop. When you land the compression from that landing should launch you into the next jump. The tendency early on is to land, recover from the compression, then lower your heels again to prepare for the next jump. Also I think it’s important to practice a little every day rather than a lot every few days because of what I call muscle memory. If you’ll let me know how you’re doing and any problems you may run into I’ll try to be as much help as I can. I actually enjoy jumping more every time I do it even now. Once you get past the tedium of just getting over the rope consistently it just keeps being more fun every single time. But in the end it all works because of the music.